Solar panels are just one way to make a home more eco-friendly. EcoHome Expert Inc., in Belvidere, not only installs solar panels but, when installing asphalt shingles, it recycles the waste so it can be used in other applications, such as roadways or other roofing products. When it comes to making an environmental impact, the first thing that comes to mind typically isn’t roofing. But the brothers behind EcoHome Expert Inc. made eco-friendliness a core part of the business’ mission from day one. Brothers Robert Raleigh III and Jason Zipse launched EcoHome Expert Inc. in 2009, offering home contracting services to the Rockford region. 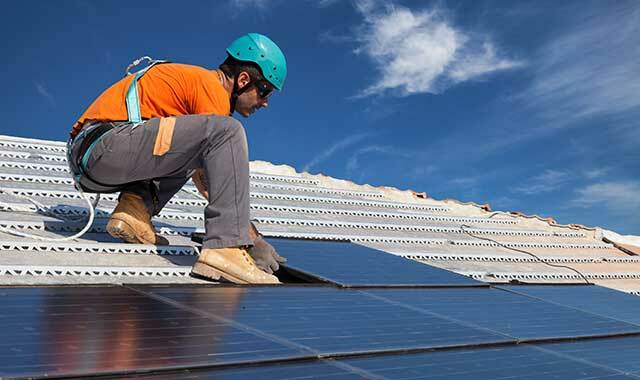 The brothers also offer roofing and siding services through Kanga Roof and solar panel installation through Qwik Solar, both of which are divisions of EcoHome Expert. After years of working in the construction industry, Raleigh and Zipse saw a need for change and wanted to make sure they did things differently when they launched their business. One aspect of the roofing industry that really stuck with Raleigh and Zipse was the amount of asphalt shingles that went straight into landfills. They’re actually recyclable. According to the Asphalt Roofing Manufacturers Association, recycled asphalt shingles are most commonly used to make asphalt roads by grinding up the shingles and adding them to the asphalt mix. This reduces the need to make new asphalt, saving money and reducing the environmental impact of additional production. They can also be used to make recycled roofing products, road maintenance products, dust control on rural roads, temporary driveways or even fuel. The company is also committed to educating area residents that solar panels aren’t just for environmentalists or the wealthy. According to the EPA, most of the electricity in the U.S. is generated using fossil fuels such as coal and natural gas, which both contribute to climate change and air pollution. These sources aren’t renewable, so once they’re gone, they’re gone. That’s the type of energy source your house is most likely using (unless you have solar panels or wind turbines). However, energy sources like solar, wind and water are renewable, meaning, theoretically, we won’t run out of these energy sources any time soon. All sources of energy have some sort of impact on the environment, but renewable energy has a significantly lower impact than non-renewables. Switching to a renewable energy source isn’t as out of reach as it might seem, says Fredrickson. When installed under the right circumstances, solar panels can save money over time. Most of EcoHome Expert’s solar panel customers are actually residential, not commercial. Fredrickson says the best candidates for solar panels plan on staying in their homes for more than just a few years and have south-facing roof slopes that are free from shade for most of the day. Being eco-friendly can also come with some tax benefits for area residents, says Fredrickson. Some homeowners might be eligible for a tax credit worth 10 percent of the cost of upgrading to a more energy-efficient asphalt roof, not including the cost of labor. For those considering solar panels, there are both state and federal tax incentives available. Some homeowners can claim a tax credit of 30 percent for solar panels placed in service by Dec. 31, 2019. And in Illinois, there’s a property tax incentive when you install a solar energy system. EcoHome Expert’s commitment to eco-friendliness and quality has proven a successful business model for Raleigh and Zipse. The company continues to grow year after year, as its crews deliver upon their eco-friendly mission to homes in Illinois, Wisconsin and Iowa. This entry was posted on Friday, August 17th, 2018 at 12:00 pm	and is filed under Home & Garden, Top Posts. You can follow any responses to this entry through the RSS 2.0 feed. Both comments and pings are currently closed.